"Ruggmor" has led a rather sedate life running his household along with his kennelmate "Ping". 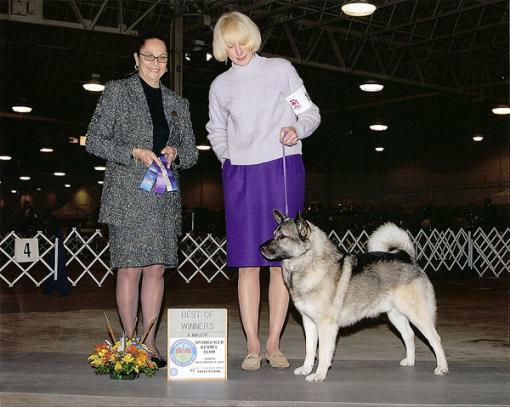 He is the beloved soul mate of Carol Watt who named him in remembrance of Elkhound family members of years gone by. Carol handled him to his title and he finished with a Best of Breed over Ch. under breeder Chuck Trotter ("Vin-Melca"). He sired a very nice litter for us when bred to Ch. Fanarok Kamgaard Kelsey and we feel his overall strengths are in his soundness, substance and bone.